* FAT 32 format supports. * IPHONE / IPAD: You need to install "AGP FILE " app from App Store before connecting with your IPhone / IPad. * ANDROID PHONE: No software installation required. Works with all smartphones with a micro USB connector (Type A and B) without additional programs. Just insert it into the smartphone and it's ready to use! * NO NEED TO PAY EXTRA for additional storage, just plug it in and enjoy your extra space for your device. * YKING IOS FLASH DRIVE EXCELLENT solution for transferring files, videos, pictures back and forth from your iPhones and iPads, your Android smartphones and your computer. * SMALL & COMPACT device will fit almost anywhere. Store your favourite movies or TV shows from your computer on your YKing Flash drive and watch anywhere, anytime. * DOWNLOAD DIRECTLY to the ios android flash drive. Take photos and videos to the flash drive bypassing your phone. 3 IN 1: LIGHTNING + MICRO USB + USB. 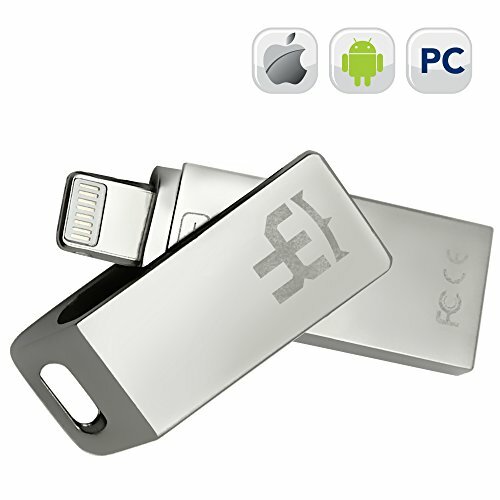 IOS IPhone flash drive lightning - micro usb flash drive - USB flash drive for PC. IOS - For IPhone - IPad - USE App "AGP FILE". IOS flash drive for IPhone & IPad for Iphone X-8-8Plus-7-7Plus-6-6Plus-SE-5-5s. ANDROID - No software installation required. Works with all smartphones with a micro - mini USB connector (Type A and B) without additional programs. Flash drive for android. Just insert it into the smartphone and use it! EASY TO USE: Download directly to the flash drive IPhone-Android. Take photos and videos to the flash drive bypassing your cell phone or iPad. If you have any questions about this product by Y-king, contact us by completing and submitting the form below. If you are looking for a specif part number, please include it with your message.